Using special software and an IP reader attached to an Ethernet network, IP based access control secures doors equipped with strikes and/or magnetic locks that can only be opened with an IP reader combined with the correct radio-frequency identification (RFID) device. Readers contain lists of individuals permitted to enter a building while software downloaded on a central computer controls the system by adding authorized people’s names to the list. Any changes are transmitted to the reader while providing relevant information to IT departments about who enters through a particular door and what time they enter that door. Designed for outdoor and indoor use, readers may also offer optional keypads for supplementary personnel verification and use different types of RFID devices such as keychain fobs. In addition, IP readers incorporate intelligence so that when a network is down, the reader continues functioning normally. Door access control devices that analyze and verify the shape and size of a person’s hand are called hand geometry door access control systems, or simply hand or palm ID scanners. Detailed information regarding the unique vein patterns of an individual hand is stored in a database, which then grants or denies access within half a second of scanning a person’s hand. Near-infrared technology captures a superior, high-resolution photograph of the veins crisscrossing a person’s palm that is instantly digitized and recorded in device’s database. Currently used in many government and industrial settings, fingerprint scanners work well to prevent unauthorized access but they are not infallible. Optical fingerprint scanners may have difficulty distinguishing an image of a finger from the finger itself. Alternately, capacitive scanners can even be fooled by professional molds of fingertips and their patterns. Fingerprint scanners equipped with heat and pulse sensors also exist that can verify whether a scanned finger is actually alive. As an unobtrusive and more aesthetic version of traditional turnstiles, virtual turnstiles use long-range radio frequency identification to monitor people entering or leaving a facility, automatically detecting authorized individuals while identifying and preventing unauthorized intruders. If someone without a verifiable ID on their person tries to pass through a virtual turnstile, the system activates an alarm so that the proper steps can be taken to eliminate the risk. 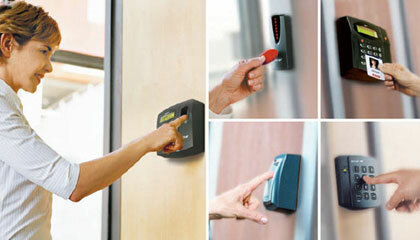 Alarms emitted by virtual turnstiles may also be in the form of vibrating pagers, strobes or other audible alarms. Images of unauthorized intruders may be transmitted immediately to security staff as well. One advantage of virtual turnstiles is that they provide effective commercial security in high traffic areas where people are entering and leaving from every direction. Relying on state-of-the-art hardware and complex algorithms, fingerprint scanning terminals utilize optical sensors with the ability to scan wet and dry fingertips at a rate of 20,000 per second. Using Wiegand technology, IP65-certified exteriors and Power-over-Ethernet (PoE), these sophisticated, high-speed scanners also feature TCP/IP, RS485 networking interfaces and USB. Weaknesses in conventional door access control systems are constantly being discovered and breached by tech-savvy criminals. In response to the demand for futuristic security measures, biometric developers are exploring the possibility of electrocardiogram identification as a practical application. Research into the patterns comprising a person’s ECG shows a distinct pattern exists within an ECG similar to those of one-of-a-kind fingerprints. In other words, the physiology and anatomy of one heart is totally unique from other human hearts. Once this pattern is established as belonging exclusively to a certain individual, it can be used as part of a biometric access system. By analyzing “dwell time” (how long keys are pressed) and “flight time” (essentially, how fast a person types, keystroke dynamics may be used to verify the identity of someone inputting an alphanumeric code into a keypad that controls entry into a facility. Once a person’s keystroke behavior is recorded, it undergoes an algorithmic process every time that person uses the system. If the comparison score falls below a certain number, the KD access control device prompts the user to enter a cognitive password, such as their birth city or mother’s maiden name, before allowing them to enter. Great Valley Lockshop offers the latest in door access control systems designed to safeguard your business during the day and at night. If you’re not sure what kind of commercial security system would best suit your needs, contact us and we’ll be glad to assist you in developing an effective and dependable system that protects your business from criminal activity. Call us at (610) 644-5334, email [email protected] or fill out our contact form.